I love bakeries. 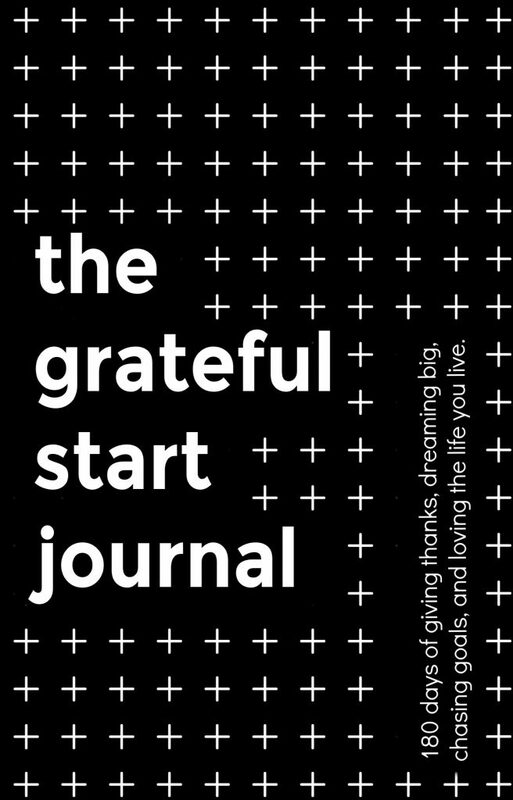 I wish I could live in one. Seriously. The next best thing to living in a bakery is baking where you live, I suppose. Baking bread, especially Italian bread, can be tricky in a home oven. It’s tough to get the temperature hot enough for it to turn out with the correct crust and texture as in a commercial oven. Side note: Did you know that commercial bakery ovens reach up to 800 degrees F? One of the great things about living in Italy is that freshly baked Italian bread is just a short walk away, no matter where you live. There are bakeries on nearly every block it seems. (Although finding one that is open is sometimes a trick.) You wouldn’t believe how cheap the bread is here either! On several occasions I have filled a shopping bag at the bakery with anything and everything that sounded good (or that I could figure out how to ask for in Italian) and only spent the random change I had rattling around in my pocket. It’s a bargain, I tell you. For this reason, I have been buying the majority of our bread here, as opposed to at home where I bake most of our bread. 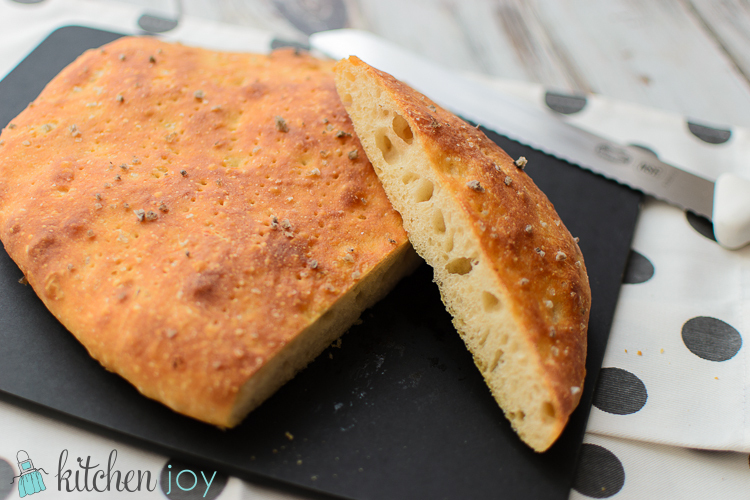 I have never had the motivation to make homemade focaccia until recently, but I desperately want to be able to enjoy great focaccia when we return to Michigan next month. I’ve tried a few different recipes and methods for focaccia, and then finally had great success the other day (with the exception of a hideous burn on my hand and wrist–guess I’m glad my oven doesn’t reach 800 degrees after all). 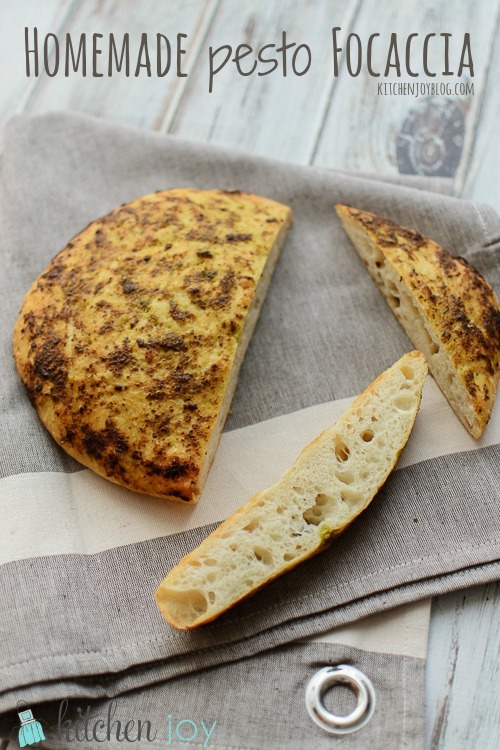 In order to make homemade focaccia at home (or in a rental apartment in a foreign country, for that matter), you don’t need a lot of special equipment. No mixer or fancy pans. A baking stone is recommended, but since mine is back home in Michigan, I proceeded without and still yielded excellent results that were just as good as any bakery I’ve been to in Italy. (I know, it’s a big claim, but it’s true!) All you really need is a mixing bowl, a wooden spoon, a rubber spatula, a couple of baking sheets, and a fork. And some patience. From my various attempts, I found that the best flavor came from allowing the yeast/flour/water mixture to ferment for 18 hours. This mixture is known as a “biga” here in Italy, but is called a “poolish” in France, and often referred to as “sponge” or a “starter” in the U.S. 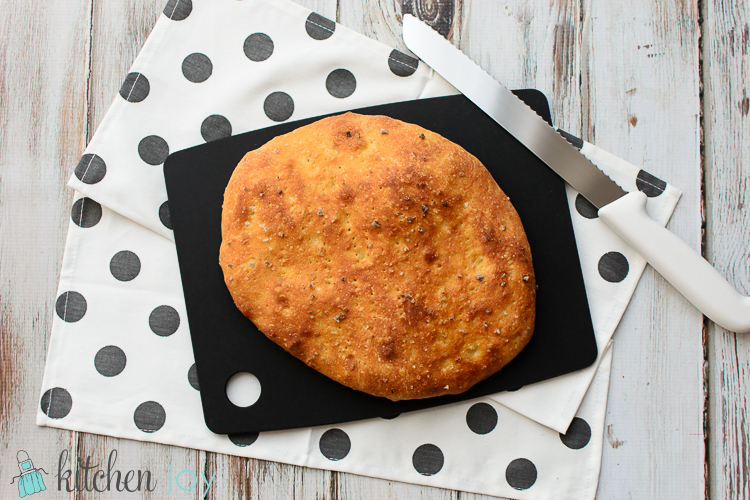 The nice part about making your own focaccia is that you can add whichever seasonings you would like. 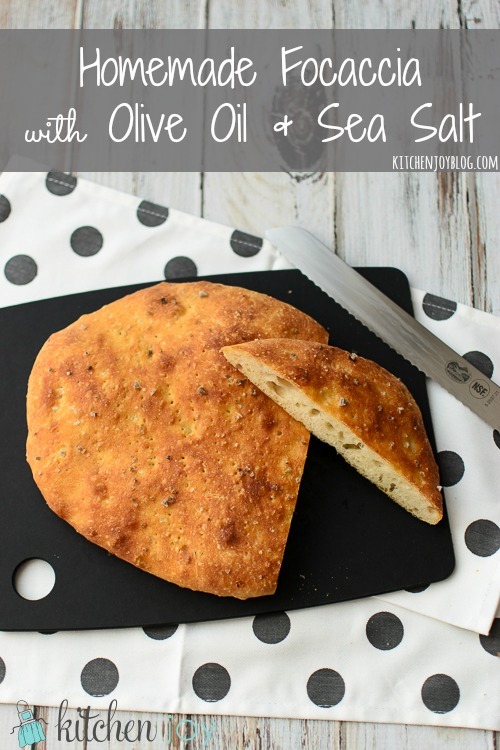 This recipe makes two loaves, so I made one Focaccia with Olive Oil and Grey Salt using some of the Brittany Grey Salt I bought while we were at Eataly in Milan. The other loaf I made was topped with Pesto. Fresh rosemary is a very popular topping for focaccia here in Italy, but personally, I don’t care for it. Because there are so many steps, I have included step-by-step photo instructions, followed by the printable recipe. Please don’t be intimidated. 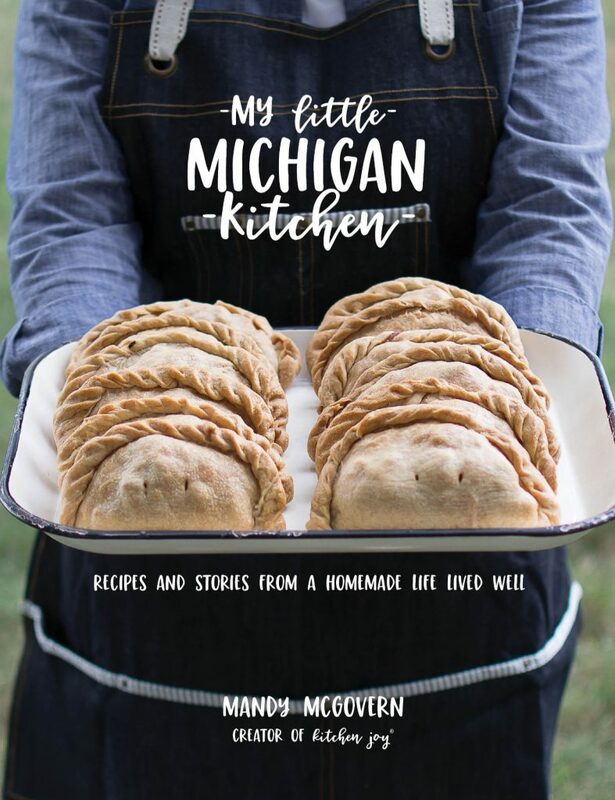 There are a lot of little steps, with several periods of resting the dough in between. Instead of hand-kneading the dough, there is a process of “folding” the dough with a rubber spatula which is nice because the dough is so sticky, and it helps eliminate the temptation to add too much flour or to overwork the dough. 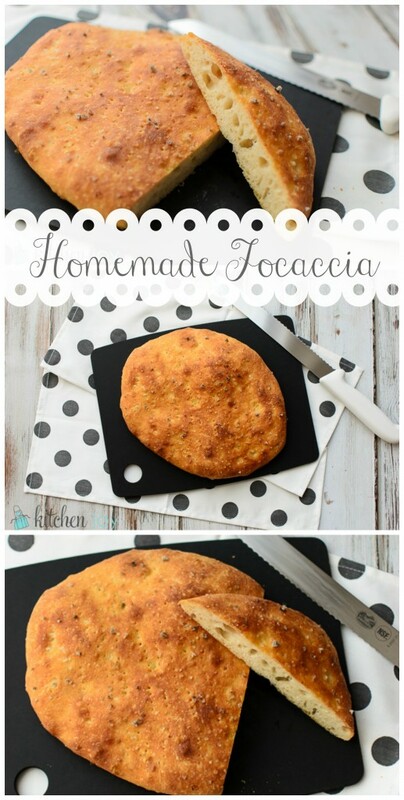 While this type of project is not everyone’s cup of tea, I hope you will give this focaccia a try sometime! 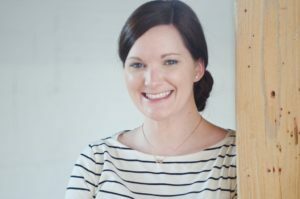 My Hubby was a very vocal supporter of this recipe. Both the Olive Oil & Grey Salt version as well as the Pesto version will be making repeat appearances on our menu on a regular basis. 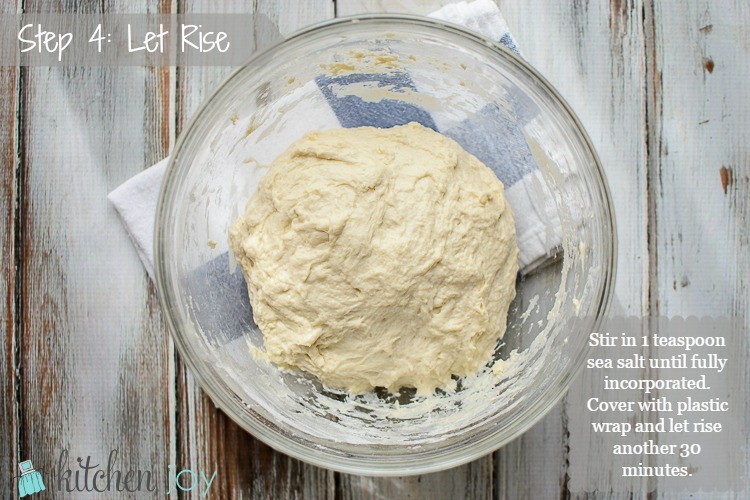 In a large bowl with a wooden spoon, stir together 1/2 cup all-purpose flour, 1/3 cup room-temperature water, and 1/4 teaspoon instant/rapid-rise yeast until all flour is incorporated. This is called a "biga". 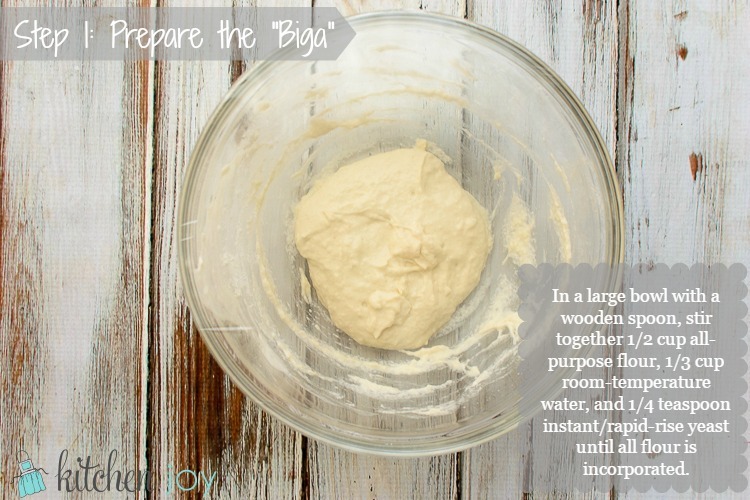 Cover the biga tightly with plastic wrap, and let rest at room temperature for 18-24 hours. Add 2 1/2 cups all-purpose flour, 1 1/4 cups warm water (100-110 degrees F), and 1 teaspoon instant yeast into the biga. Stir with a wooden spoon until all ingredients are fully incorporated. Cover with plastic wrap and let rest 15 minutes at room temperature. Stir in 1 teaspoon sea salt until fully incorporated. Cover with plastic wrap and let rise another 30 minutes. Using a lightly-oiled spatula, gently fold the dough from the outside into the middle. Rotate the bowl 45 degrees and repeat folding 4 more times. Cover with plastic wrap and let rise for 30 minutes. Repeat folding and rising process two more times. 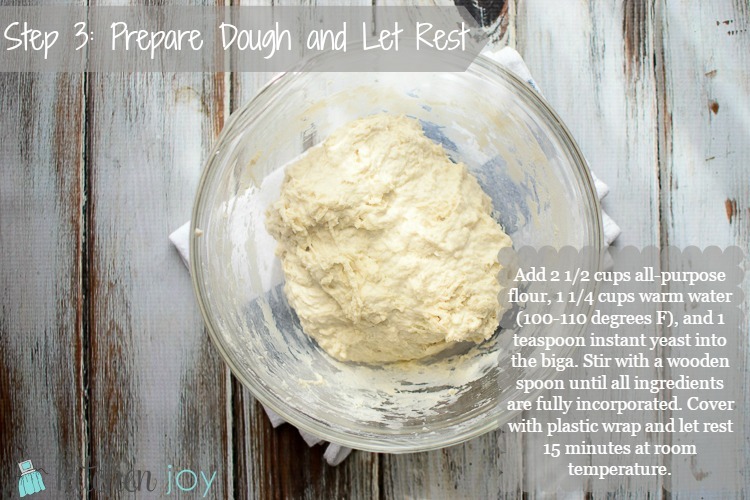 (Fold dough 3 times and let rest 3 times total.) This step acts as the kneading process and will take just over 90 minutes. 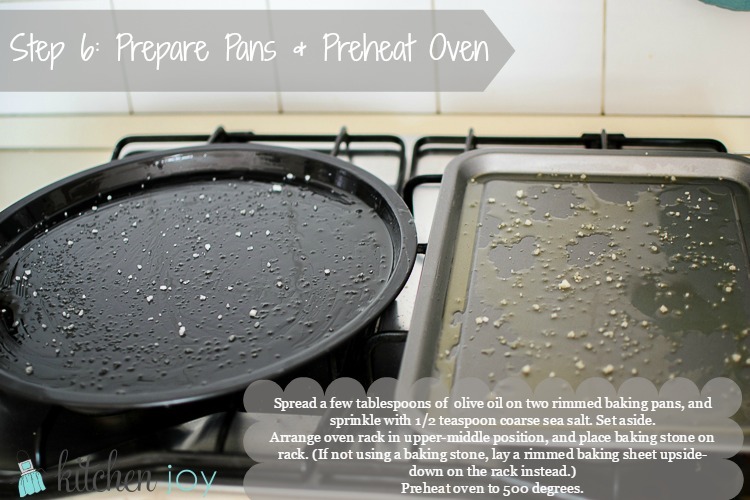 Spread a few tablespoons of oil on two rimmed baking pans, and sprinkle with some of the coarse sea salt. Set aside. 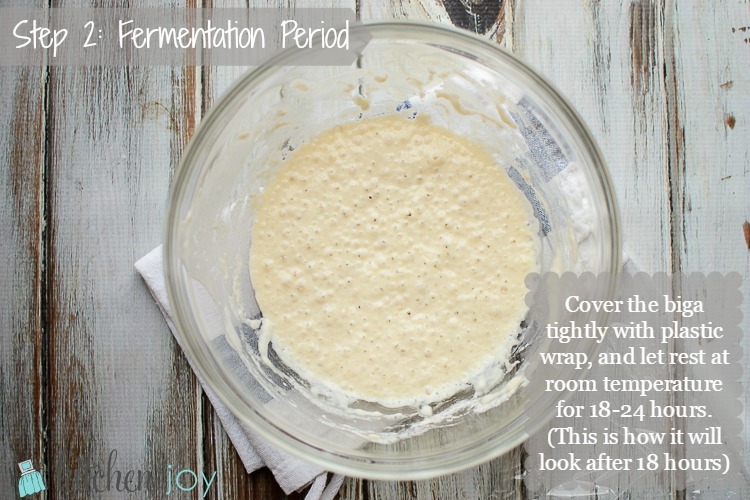 Transfer dough to a lightly-floured surface and divide in half. 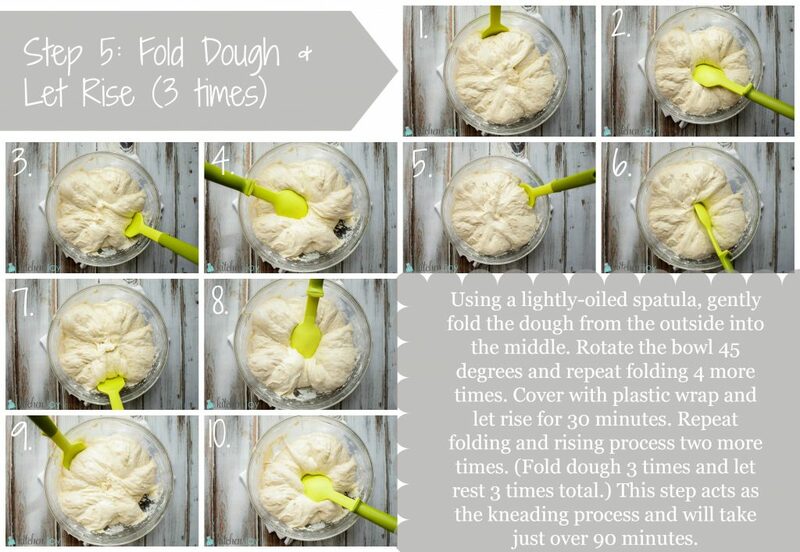 Shape each half of dough into a ball. Place one ball of dough on each prepared pan and roll it around to coat with the oil and salt. Cover each pan with plastic wrap and let rest 10 minutes. 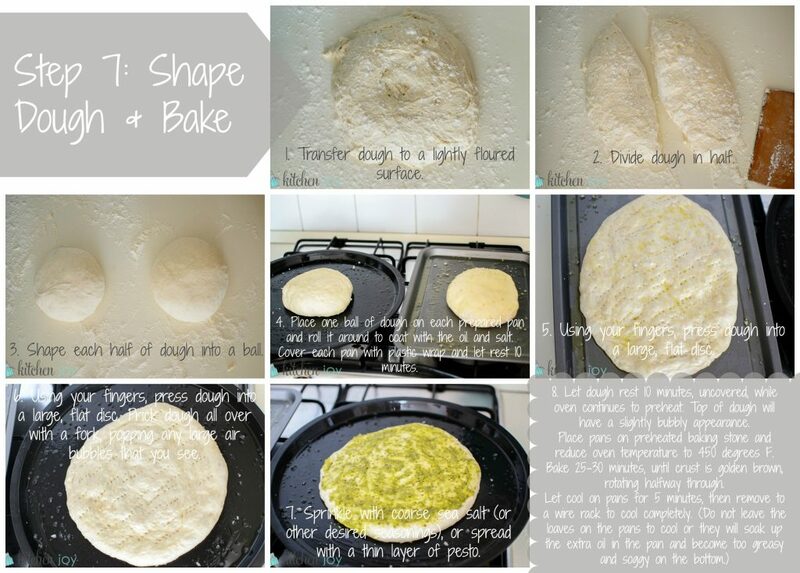 Using your fingers, press dough into a large, flat disc. Prick dough all over with a fork, popping any large air bubbles that you see. Sprinkle with more coarse sea salt (or other desired seasonings), or spread with a thin layer of pesto. Let dough rest 10 minutes, uncovered, while oven continues to preheat. Top of dough will have a slightly bubbly appearance. 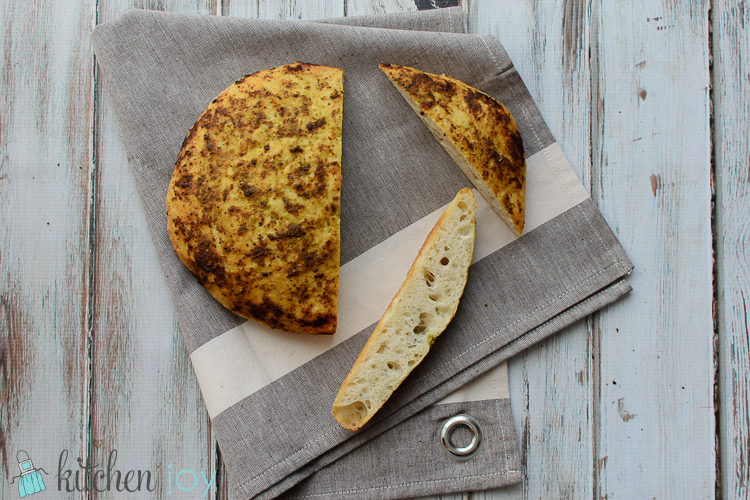 Place pans on preheated baking stone and reduce oven temperature to 450 degrees F.
Bake 25-30 minutes, until crust is golden brown, rotating halfway through.